XXXIX.1-2, 4-11, 15; Tatian's Diatessaron (c. 150-160). From Augustine's Tractates on John: Tractate 50 (12:1-12). "A horrible example in Judas of a mind blinded with covetousness, and yet pretending godliness." "Mary gave a token of love to Christ, who had given real tokens of his love to her and her family. God's Anointed should be our Anointed." "It seems Martha was a person of some figure, from the great respect which was paid to her and her sister, in visits and condolences on Lazarus's death, as well as from the costly ointment mentioned in the next verse. And probably it was at their house our Lord and his disciples lodged, when he returned from Jerusalem to Bethany, every evening of the last week of his life, upon which he was now entered." "The only use of [nard] was to refresh and exhilarate--a grateful compliment in the East, amidst the closeness of a heated atmosphere, with many guests at a feast. Such was the form in which Mary's love to Christ, at so much cost to herself, poured itself out." "Loved into Future," Karoline Lewis, Dear Working Preacher, 2019. "I wonder if in this moment, when Jesus is being loved with a grace upon grace kind of love, an abundance of love, a love that you could even smell, with a fragrance that would linger for days, that Jesus remembered his mother." "While You Still Have Me," Debie Thomas, Journey with Jesus, 2019. "What happens between Jesus and Mary in this narrative happens skin to skin." "Mary, Judas, Jesus, The Poor, and Me..." Janet H. Hunt, Dancing with the Word, 2019. "How do you keep the balance between responding to the ‘poor who are always with us’ and staying ‘still’ in the presence of Jesus?" "Judas is right: what Mary does makes no sense." "Political Posturing or a Posture of Prayer?" Amy Lindeman Allen, Political Theology, 2019. "In Jesus’ acceptance of Mary’s act of devotion, in his ministry to and for the poor, in his unwillingness to betray Judas (even as Judas was soon to betray him), Jesus models for us an approach to poverty, to politics, indeed, to one another that is based not in fear but in hope." Commentary, John 12:1-8 (Lent 5C), Eliseo Pérez-Álvarez, Preaching This Week, WorkingPreacher.org, 2016. "Judas was a saint compared to current cynicism of corporations, business or telethons asking people who barely make a living to donate to the poor." "The Unexpected God," David Lose, ...in the Meantime, 2016. "Simultaneous Smells," Karoline Lewis, Dear Working Preacher, 2016. "The simultaneous smells of life and death -- that's the hard part about this text." "The Love of Mary," Andrew Prior, One Man's Web, 2016. The Fragrance of Faith, David F. Sellery, 2016. "Judas and Mary in Contrast," D. Mark Davis, Left Behind and Loving It, 2016. "Remembering particularly in this version of the story that the narrator utterly dismisses Judas' feigned concern for the poor, it would simply be ludicrous to posit these words as some kind of takedown of generosity over and against the oft-repeated commands in the Scriptures to give liberally to the poor." "Leave Her Alone," Lynn Miller, celebrating our creative and living God by generating art and architecture resources for congregations and individuals. Art and Faith Matters facebook page contains additional resources. "As the cross looms larger and larger in the weeks to come, the task before us is pulled into stark outline. We are called to give all. Our very lives are at stake." "The Anointing," Janet Hunt, Dancing with the Word, 2016. "I wonder if by anointing his feet, Mary is also recognizing this --- that in his living, Jesus was as 'grounded' as the rest of us." The Politics of Extravagance, Robert Williamson, Jr., Political Theology Today, 2016. "The House was filled with the fragrance of the perfume," Prospect, Robert Warren, 2016. "The Woman Jesus Adored," Nancy Rockwell, The Bite in the Apple, 2016. "A Scandalous Gift of Love," Modern Metanoia, 2016. Commentary, John 12:1-8 (Lent 5C), Susan Hylen, Preaching This Week, WorkingPreacher.org, 2013. "The story of Mary’s anointing stands in contrast to the idea of many Christians today that what matters most is belief in Jesus -- and by belief we mean conscious, doctrinal understanding of Jesus. Mary’s faithful action is different." "Her Extravagant Holiness," Alyce McKenzie, Edgy Exegesis, 2013. "By her actions, she says, 'I would like to introduce Jesus, the lamb of God who takes away the sins of the world, the suffering, serving Son of Man, the Son of God who, for a little while, gave us the opportunity to sit at his feet. I would like to cherish him for one bright, fragrant moment, before the sewage of hatred and violence washes over him and carries him away.'" "Questions about Discipleship," David Lose, Working Preacher, 2013. "I know, on the narrative level Jesus is talking to Judas, both reprimanding him as well as interpreting Mary’s gift. But given my own strong reaction both to the cost of Mary’s gift and the intimacy with which she gives it – washing his feet with her hair? really? – I wonder if Jesus is not also addressing himself to me and perhaps to all of us who shrink back from such unconventional and excessive outpourings of faith, love, and service." "Leave Her Alone," Rev. Anne S. Howard, A Word in Time, The Beatitudes Society, 2013. "...we know that we will see Jesus repeat this act of love and hospitality with his disciples, at another supper just down the road, in that upper room in Jerusalem." Lectionary Greek, John 12:1-8, Rob Myallis, 2013. Holy Textures, Understanding the Bible in its own time and in ours, John 12:1-8, David Ewart, 2013. "There He Was," Rick Morley, 2013. "I think if I were there in that room, I’d want to be looking at Jesus, but my eyes would keep wandering over to Lazarus." "The Politics of Passion," Rachel Mann, Political Theology, 2013. "...For the God in Christ is all about passion: he becomes our victim, handed over to us, the subject of our jealousies, fears and our desire to be in control. This is a god who gets filthy in the dust of Palestine. This is a god tortured at the end of a whip. This is a god who is mocked and killed. This is no clean, unsullied immortal. This is a man thoroughly caught up in and destroyed by the violence of the world." "The Poor Will Always Be With You," Carol Howard Merrit, The Hardest Question, 2013. "And so the hardest question for me becomes, how do we preach the love of Christ, who fed and healed people, in the light of Jesus saying, 'The poor will always be with us?'" Mary Anoints Jesus, audio telling, story in episodes, graphic, audio and written commentaries. Go Tell Communications, Biblical Storytelling for the Global Village, 2013. "On Costly Nard and Cheap Hand Lotion," the Rev. Dr. Janet H. Hunt, Dancing with the Word, 2013. "It is only in John's Gospel that Judas is identified as the one voicing his objection to Mary's action. It is interesting to lay the parallel accounts alongside one another. (See Matthew 26:6-13, Mark 14:3-9, and Luke 7:36-50 to compare the differences.) Matthew's account, for instance, has all the disciples speaking up. Why the difference?" "A Beautiful Thing," Nancy Rockwell, Bite in the Apple, 2013. Comentario del Evangelio por José Daniel Barahona Suazo, San Juan 12:1-8, Working Preacher, 2013. Commentary, John 12:1-8 (Lent 5C), Matt Skinner, Preaching This Week, WorkingPreacher.org, 2010. "Extravagance. Pleasure. Effusiveness. Exuberance. These aren't ideas that we usually associate with Lent and the overture to Jesus' passion." "First Thoughts on Year C Gospel Passages in the Lectionary," Lent 5, William Loader, Murdoch University, Uniting Church in Australia. "The unlikely ones in Mark and John?s world, the women, become the models. This is deliberately subversive and reflects so much of the experience of Jesus? ministry. Others were so good, so devout, and so busy being so, that they missed the point." "Are We Having Fun Yet?" Mary Hinkle, Pilgrim Preaching: Keeping Company with Biblical Texts and the People Who Hear and Preach Them. "The best dancing is done on the devil's dance floor. Perfect love casts out fear. It does so by offering a security that all the carefulness in the world cannot match." "If Mary is the model disciple, then Judas is presented as her contrast. Mary is generous. If the ointment were worth 300 denarii, that is roughly equivalent to a year's salary. (1 denarius was about one day's pay.) Judas is greedy -- taking what doesn't even belong to him. Mary illustrates her faith with actions. Judas talks piously -- "giving to the poor" -- but we know that he is not sincere. Both "prepare" Jesus for burial -- she by the "anointing" and he by the betrayal." "There's no soul in safety, only shadows," Peter Woods, I Am Listening, 2010. "Is it not true that only when we have been helped by God, that we begin to understand how to live extravagantly in honouring Christ wherever we may find him?" First Look: John 12:1-8, Lee Koontz, reflectious, 2010. "Jesus? response to Judas is oftentimes used to minimize the importance of the Christian obligation to care for the poor and needy. It is very important to note that Jesus? response is a quotation from Deuteronomy 15:11, the entirety of which reads, 'Since there will never cease to be some in need on the earth, I therefore command you, ?Open your hand to the poor and needy neighbor in your land.?' Rather than minimize one?s obligation to care for the poor, Jesus here quotes a verse which explicitly commands it." "The meaning seems to be that Mary "has kept" the ointment until this moment so that she might use it to anoint Jesus. It would not make a lot of sense for the phrase to mean keeping the ointment for later embalming because she has already used it up." "Anointing at Bethany and Washing of Jesus' Feet," Gospel Analysis, Sermons from Seattle, Pastor Edward F. Markquart, Grace Lutheran Church, Seattle, Washington. Detailed background and exegesis. "Have you ever seen or experienced someone physically caring for a loved one in preparation for that dying person's death? Please describe that experience." Kairos CoMotion Lectionary Discussion, John 12:1-8, Wesley White. "A place of conversation regarding Progressive Christianity." "If we can associate Jesus with the outcasts, a question for Mary is whom should we be anointing today? Might it be the poor and would that, after all these years, reconcile Mary and Judas?" "Mary Anoints Jesus for His Burial," Rev. Bryan Findlayson, Lectionary Bible Studies and Sermons, Pumpkin Cottage Ministry Resources. "Christian fellowship can promote very close male/female relationships. How do we maintain integrity in these relationships?" "And the Fragrance Filled the House," exegetical notes by Peter L. Haynes. "Of course, 300 denarii have their own aroma, for good or for ill. However, the real fragrance beginning to waft through the room is from the impending crucifixion of Jesus, of which his disciples have caught only a faint sniff." "In the later rabbinic literature, Ecclesiastes Rabbah 7.1.1 states "The fragrance of good oil is diffused from the bedroom to the dining hall, but a good name is diffused from one end of the world to the other." If such a saying were known in the first century, this might be John's way of indicating that Mary's act of devotion would be spoken of throughout the entire world (compare Mark 14:9)." Lectionary Commentary and Preaching Paths (Lent C5), by Jirair Tashjian, at The Christian Resource Institute. "One of the theological issues raised in this passage is the interplay between the evil scheming going on behind the scenes to bring about the death of Jesus and the divine purpose working out in history. In the midst of the ugliness and hostility plotted against Jesus by the powers that be, common folk like Mary and Martha (women at that!) show hospitality to Jesus and recognize in him the Messiah." "Attitudes to the Poor in New Testament Times," Jerome H. Neyrey, S.J., University of Notre Dame, 2002. "When taxes were so high, life for peasants was at best ?subsistant,? i.e., they had only several months of food stored. The wolf was always at the door. And there was no unemployment insurance, no social security, no medicare. The state took the surplus of peasants and gave them nothing in return." Bruns, J. Edgar, "A Note on John 12:3," The Catholic Biblical Quarterly, 1966. Coakley, J.F., "The Anointing at Bethany and the Priority of John," Journal of Biblical Literature, 1988. Eslinger, Lyle, "Judas Game: The Biology of Combat in the Gospel of John," Journal for the Study of the New Testament, 2000. Holst, Robert, "The One Anointing of Jesus: Another Application of the Form-Critical Method," Journal of Biblical Literature, 1976. Legault, André, C.S.C., "An Application of the Form-Critique Method to the Annointings in Galilee and Bethany," The Catholic Biblical Quarterly, 1954. Long, Thomas G., "Gospel Sound Track," The Christian Century, 2001. Michaels, J. Ramsey, "Expository Article: John 12:1-11," Interpretation, 1989. Simmons, Elizabeth McGregor, "The Sense of Text: An Invitation to Lenten Preaching," Journal for Preachers, 2004. Sanders, Beth, "Heaven Scent," The Christian Century, 2007. Satoko, Yamaguchi, "Christianity and Women in Japan," Japanese Journal of Religious Studies, 2003. Songer, Harold S., "John 5-12: Opposition to the Giving of True Life," Review & Expositor, 1988. Worshiping with Children, Lent 5C, Including children in the congregation's worship, using the Revised Common Lectionary, Carolyn C. Brown, 2016. "Mary Puts Lotion on Jesus' Feet," Sunday School Lessons: Family Bible Study, art projects, music, stories, etc. "World's Best Gift," Cherry Grove Baptist Church, dramatix. Clip Art Images: John 12:1-8, John 12:1-8 #2, Misioneros Del Sagrado Corazón en el Perú. John 12:1-8 at Cerezo Barredo's weekly gospel illustration. Liberation emphasis. 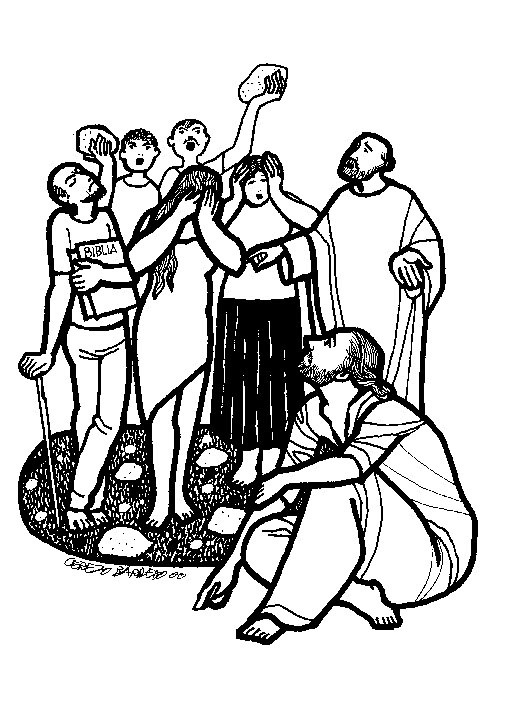 Clip Art: Jesus Anointed at Bethany, Julius Schnoor von Carolsfeld woodcuts, World Mission Collection, Wisconsin Evangelical Lutheran Synod. "Since We Belong to Christ" Text: Carolyn Winfrey Gillette. A new hymn based on John 12:1-8 and Philippians 3:4b-14; Tune: CARLISLE 6.6.8.6 ("Stand Up and Bless the Lord"). "When Mary Poured a Rich Perfume," Text: Carolyn Winfrey Gillette, Tune ELLACOMBE 8.6.8.6 D ("I Sing the Mighty Power of God") or FOREST GREEN ("How Beautiful the March of Days"). A new hymn on Mary's Anointing of Jesus (John 12:1-8). Hymns with Scripture Allusions: John 12:3, 4. The Cyber Hymnal.